14 year old Habiba Isiyaku whose father, Isiyaku Tanko at a press conference in Abuja on Wednesday accused the Emir of Katsina, Abdulmumini Usman of marrying off his daughter to her abductor, Jamilu Lawal, has denied the allegation, stating that she was neither coerced or forced into accepting Islam as a religion or getting married to her abductor, Jamilu. According to Daily Trust, Habiba said this while speaking before a joint committee session with officials of Katsina Emirate, Christian Association of Nigeria (CAN) Katsina chapter, and security personnel yesterday October 13th. 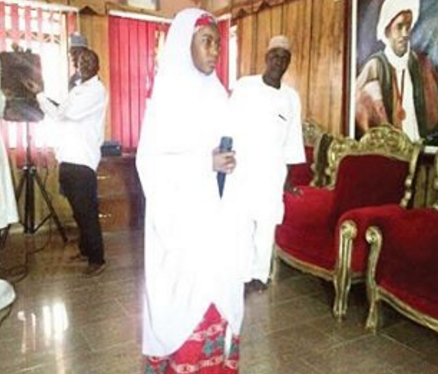 Meanwhile the Emir of Katsina who was represented at the meeting by the one of the king makers, Nuhu Abdulkadir, the ‘Kauran-Katsina’, denied claims of forcefully marrying Habiba off to Jamilu. According to Nuhu who spoke on behalf of the Emir, Habiba got married out of her own volition. He said Habiba's father, Tanko, had petitioned the police over claims that she was abducted by Jamilu a worker in the Emir's palace, converted to a Muslim and then got married too without his consent as her father. Nuhu said the palace upon receiving the petition from the police, carried out its independent investigation which showed that Habiba was forced into marriage or converted to a Muslim as claimed by her father. He said in the course of the investigation, Habiba had shown interest in marrying Jamilu and a wedding was conducted by the Emirate who received a bride price of N50,000. Nuhu added that the police also interrogated Habiba where she stated she was neither forced nor coerced and that she doesn't want to go home with her father. Nuhu claimed Habiba's father after the investigation, wrote a letter to the emirate, apologizing for his false claims.